A few weeks ago, I was contacted by Krave Jerky to sample some of their jerky, and if I liked it, promote them to my followers and give them a good review. I was told their recipes were all-natural and had been recently reformulated to be gluten-free. I thought they would mail me the samples, but to my surprise, the regional manager showed up at my door to drop it off herself. I thought it was great that they used such a personal touch. As she handed me my bag of goodies, she explained to me that they recently switched to gluten-free tamari instead of wheat-based soy sauce. Two of the four bags I received had wheat-based soy sauce in the ingredients list. 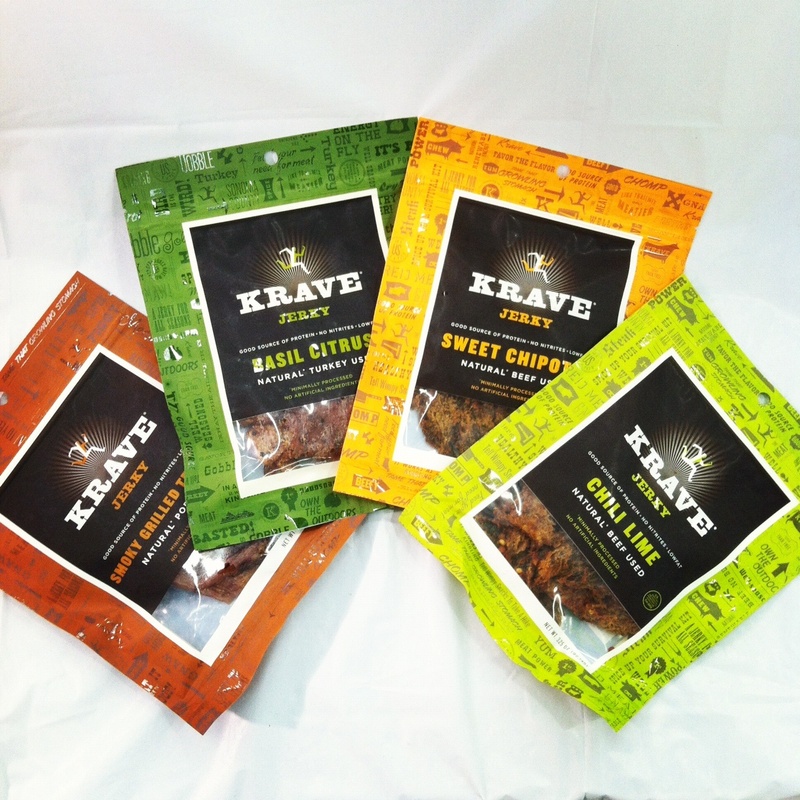 Krave explained that due to their recent transition to a fully gluten-free product line, the new gluten-free jerky samples were in old packaging with outdated ingredient labels. Still, they assured me that the jerky was completely gluten-free. I was under the impression that their gluten-free products being sold in stores were appropriately labeled, even if my samples were not. Then, I had a gluten attack and was sick for four days. Luckily, I had only eaten a small taste of each jerky and the attack came in slow waves. It started with my bowels releasing everything that went into my system. Then the migraines, extreme fatigue and body aches kicked in. I was contacted by Becky of The Gluten Minded (www.theglutenminded.com). She had visited Krave’s website after reading my review and was confused after seeing wheat-based soy sauce in the ingredients. I hadn’t previously checked the website and was surprised by this information. After all, while my samples were in the wrong bags, I was under the impression that Krave had made the switch in their commercially available products. However, I grew suspicious given the physical symptoms I had been experiencing. So, I called the Regional Manager and she assured me that all the products I received were gluten-free. Next, I contacted the company by email to let them know I had been sick. They apologized profusely (but spelled my name wrong twice) and asked me to send the batch numbers so they could make sure I had received the gluten-free jerky. The next day, I received an email explaining that they had made a mistake: the jerky I received was actually the old recipe with the wheat-based soy sauce and they “highly suggested” I not eat those products. They also admitted that in stores, Krave was selling some of the new gluten-free jerky in old bags as well as gluten-containing jerky, only adding to the confusion. It appeared that within the company, some people were aware that this was happening, but many were not. Hence, I received a variety of different stories from various Krave employees. Krave apologized and told me that their whole line would be gluten-free by May and then offered to send me their entire line of gluten-free jerky. Needless to say, I declined their offer–I can’t say that I will ever be able to trust this company again. It goes without saying that a company should not be representing itself as gluten-free if they aren’t completely gluten-free but will be soon. Krave Jerky needs to ensure that all their employees are educated and have the right information, which was clearly not the case. Also, to date, the company still has not changed their website and gluten-containing packages can still be found on shelves in many stores. I accept full responsibility for not taking my own advice: READ LABELS. I thought I had asked all the right questions, but I should have pressed harder about the packaging/ingredient discrepancies. No matter how many times I was reassured by various Krave employees, I should have been more suspicious of their inconsistent labeling and contradictory information. This is a big lesson learned and I am sorry if I misled anyone. Now, while Krave Jerky might be safe in the future and offer a gluten-free line, I would urge people to not purchase products from a company that acts so irresponsibly. While I understand that Krave did not intend to do harm, their lack of organization and inability to educate their employees about their products is a serious mistake. Krave should not make any gluten-free claims until the transition is complete. It is now 2015 and I see all these comments are from 2013. I have bought Krave beef jerky twice and now know it’s what caused my entire family to feel extremely ill. Migraines, nausea, stomach pains, and basically all the symptoms of either food poisoning or who knows what. We are all gluten free but have never experienced this from eating something that may have contained gluten…so I’m guessing it goes beyond the gluten. I wonder if the jerky is just plain contaminated? I am going to delve into this but would like to know if anyone else got sick with these same symptoms. I have bought it on two occasions – both which ended up making everyone sick after eating it. July 2015. GF label. Maybe gfco, I have to check. OK just saw this post. We figured out this is what made us sick too. Ours had GF label as well. I just found out Krave doesn’t make anything. They have it co-packed by some of the same companies that make the most inexpensive jerky in the country. They are a marketing company that just sold out to Hershey’s. Well at least they did there best to solve the problem rather than blame the consumer. Proper costumer service is so to come by at times. I think it would have been better to not give a gluten product to a person with celiac disease to review until you are absolutely positive your product is what you state it is… A little horse before the cart. It looks like they I finally have it all worked out on their website now though. Your right. It’s a good thing they fixed it before other people got sick. Hard to trust anything you don’t prepare yourself.